Be the first to share your favorite memory, photo or story of Bernice “Bunny”. This memorial page is dedicated for family, friends and future generations to celebrate the life of their loved one. 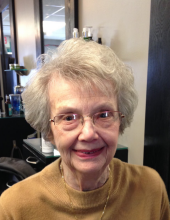 Bernice “Bunny” Fortier of Livonia, died January 31, 2019. She was 88 years old. Bunny was the beloved wife of the late Morley Fortier, who died in 2009. Bunny is survived by her 4 loving children: Morley (Sandra) Fortier Jr., Christopher (Kathryn) Fortier, Roxanne (Chuck) England, and Timothy (Joan) Fortier, 6 precious grandchildren: Morley III (Jessica), Rachel (Jon), Meghan, Nicholas (Megan), Brandon, and Travis, 5 cherished great grandchildren: Morley IV, Ari, Remington, Hailey and Jack and her 2 dear brothers: Michael “Butch”, and Doug. Bunny was preceded in death by her parents Michael and Josephine Specht, and her sisters Franny and Barbara. Her Funeral Mass will be Monday, February 4, at 12pm at St. Colette Catholic Church, 17600 Newburgh Road, Livonia, Michigan 48152. Bunny will be in state at Church at 11:30am. In lieu of flowers, memorial donations may be made to the Multiple Sclerosis Society of Michigan, 29777 Telegraph Rd, Ste. 1651, Southfield, MI 48034 or the Epilepsy Foundation of Michigan, 25200 Telegraph Rd, Ste. 110, Southfield, MI 48033. "Email Address" would like to share the life celebration of Bernice “Bunny” Fortier. Click on the "link" to go to share a favorite memory or leave a condolence message for the family.